It's been ten years since Mitch Albom first shared the wisdom of Morrie Schwartz with the world. 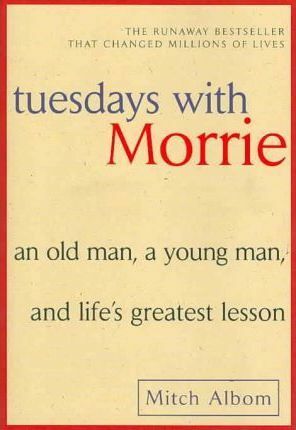 Now-twelve million copies later-in a new afterword, Mitch Albom reflects again on the meaning of Morrie's life lessons and the gentle, irrevocable impact of their Tuesday sessions all those years ago. . .
Mitch Albom had that second chance. He rediscovered Morrie in the last months of the older man's life. Knowing he was dying, Morrie visited with Mitch in his study every Tuesday, just as they used to back in college. Their rekindled relationship turned into one final class: lessons in how to live.
" This is a sweet book of a man's love for his mentor. It has a stubborn honesty that nourishes the living." --Robert Bly, author of "Iron John"
" A deeply moving account of courage and wisdom, shared by an inveterate mentor looking into the multitextured face of his own death. There is much to be learned by sitting in on this final class." --Jon Kabat-Zinn, coauthor of "Everyday Blessings" and "Wherever You Go, There You Are"
" All of the saints and Buddhas have taught us that wisdom and compassion are one. Now along comes Morrie, who makes it perfectly plain. His living and dying show us the way."